The use of psychological interventions and counselling strategies has become a central part of injury prevention, rehabilitation, and return to participation process. The Psychology of Sport and Performance Injury: An Interprofessional Case-Based Approach is the first book to offer students, academic scholars, and practitioners case studies that are grounded in psychological theory and empirical evidence, with a specific focus on addressing psychological aspects of sport and performance injuries in an interprofessional manner. This book presents nine "real-life inspired" fictional sport and performance injury cases. It demonstrates the viability and effectiveness of adopting an interprofessional, person-centered approach to injury, rehabilitation, and return to participation process. Each case is focused on a particular phase of rehabilitation, with specific attention placed on relevant biopsychosocial concerns. 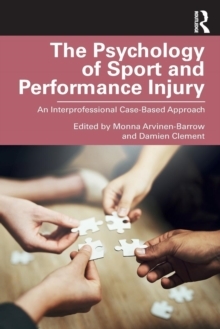 Within each chapter, a theoretical, conceptual, and empirical analysis of the case is presented followed by detailed accounts on how a range of professionals and significant others can work alongside each other to provide a holistic care for the injured performer within their own competencies. The Psychology of Sport and Performance Injury: An Interprofessional Case-Based Approach emphasizes the importance of holistic, interprofessional approach to sport and performance injury rehabilitation. This book is a vital resource for upper-level students, academic scholars, and applied practitioners from a range of sport and performance related disciplines such as athletic training, kinesiology, occupational therapy, physical therapy, sport psychology, sports therapy, and strength and conditioning. It offers a valuable reading for a range of individuals and professionals who are involved in sport and performance injury prevention, rehabilitation, and return to participation process.